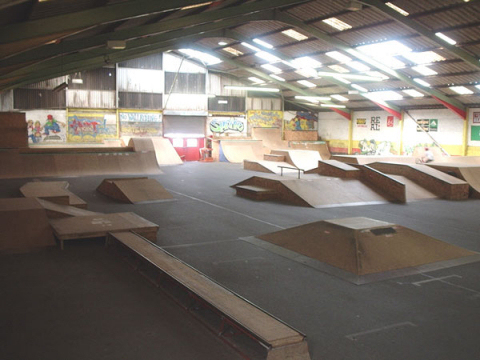 Indoor skate park consisting of ramps, grind rails, jump boxes and much more. Ideal for children 5 years and upwards. Under 16’s must have parent/guardian to sign disclaimer form. Under 12’s must have parental supervision. This park is built in two sections a beginners section and a big section. The beginners section has two roll up vert walls a mini spine and a mini rollover with mini quarter pipes joining onto them. The big sections contains a rythm section a 5ft mini ramp a 6ft quarterpipe, a manual line, a death box and a 5ft spine. a helmet. In-line bladers MUST wear helmet. Under 16’s MUST have parent/guardian to sign disclaimer form.